Personalized woven sewing labels are the perfect finishing touch for homemade sewing, knitting, quilting, or craft projects. At 3/4" inch wide, these elegant labels are available in a range of design and lettering colors, lettering styles and icons, letting you truly customize your labels! They're ideal for new or small businesses, as they are available to purchase in small batches. Labels are printed in the USA with a fast turnaround time. 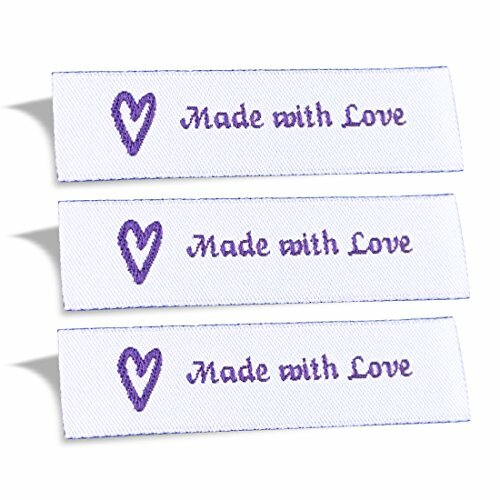 This classic readymade Wunderlabel Woven Label "Made with Love" is perfect for a range of clothing garments, whether to be used to sew on dresses, jumpsuits, shirts, blouses or customised gifts. These clothing tags are made from high quality 100% polyester and are not printed or embroidered on. They are designed to be sewn-in folded to prevent itchiness once the garment is worn. Available in different pack sizes from 25 labels, 50 labels up to 100 labels, Wunderlabel ensures excellent quality and durability using the finest materials. Our woven labels are made with professional weaving machines. Use this lovely woven tag on knitting projects, hand made items, sewing projects, hand bags, craft gifts or clothing items. Add a finishing touch to your garments with Wunderlabel's hand made woven label. Let us help you be the best you can be. A must have excellent quality "Cotton Baby Size Label" tags are great for your clothing, crafts, stationary or decorative items. These labels are easy to use for your clothing tags that are made from high quality 100% cotton. These printed labels are designed to be sewn-in folded to prevent itchiness once the garment is worn. Available in different sizes, Wunderlabel ensures excellent quality and durability using the finest and high quality materials. 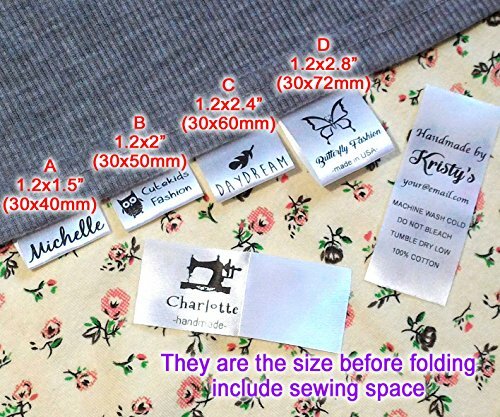 These labels or tags is perfect for wide range of clothing such as dresses, jumpsuits, shirts, blouses or napkins. 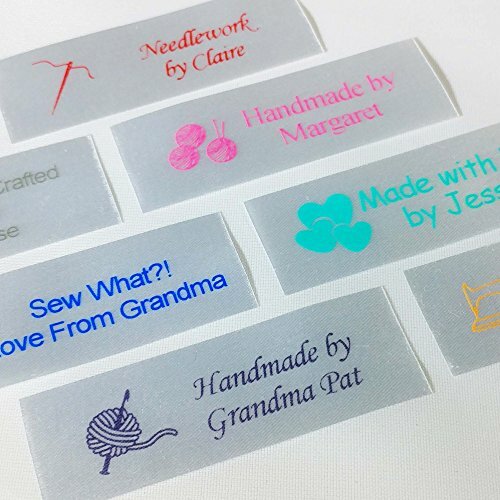 These Wunderlabel tags add a beautiful finishing touch to your garments or customized products and goods. Let us help you be the best you can be. 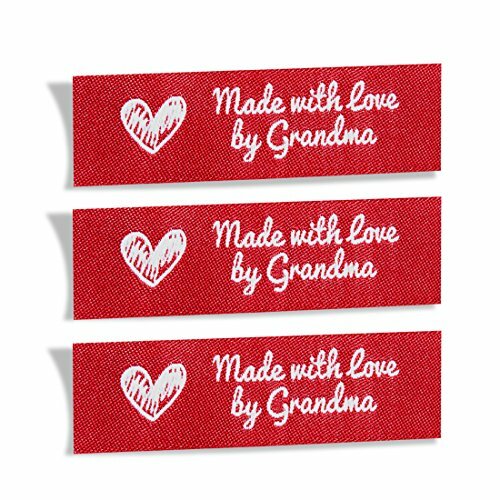 This Wunderlabel Woven Label "Made with Love by Grandma" is perfect for a range of clothing garments, whether to be used to sew on dresses, jumpsuits, shirts or blouses. These clothing tags are made from high quality 100% polyester and are not printed or embroidered on. They are designed to be sewn-in folded to prevent itchiness once the garment is worn. Available in different pack sizes from 25 labels, 50 labels up to 100 labels, Wunderlabel ensures excellent quality and durability using the finest materials. Our woven labels are made with professional weaving machines. Use this lovely woven tag on knitting projects, hand made items, sewing projects, craft gifts or clothing items. Add a finishing touch to your garments with Wunderlabel's hand made woven label. Let us help you be the best you can be. 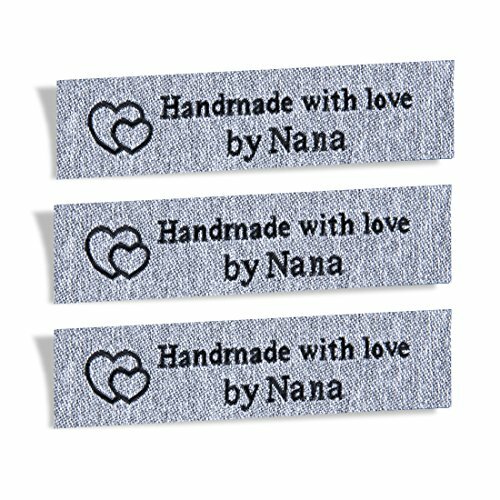 This Wunderlabel Woven Label "Handmade with Love by Nana" is absolutely cute and personalized tag for a range of clothing garments, whether to be used to sew on dresses, jumpsuits, shirts or blouses. It can also be used on hand knitted cardigans, handkerchief, socks or even Christmas presents. These clothing tags are made from high quality 100% polyester and are not printed or embroidered on. They are designed to be sewn-in folded to prevent itchiness once the garment is worn. Wunderlabel ensures excellent quality and durability using the finest materials. Our woven labels are made with professional weaving machines. Use this lovely woven tag on knitting projects, handmade items, sewing projects, craft gifts or clothing items. Add a finishing touch to your garments with Wunderlabel's hand made woven label. Let us help you be the best you can be. Add a special message to wedding favors, place cards, table settings, and more with David Tutera� Casual Elegance Kraft Tags. 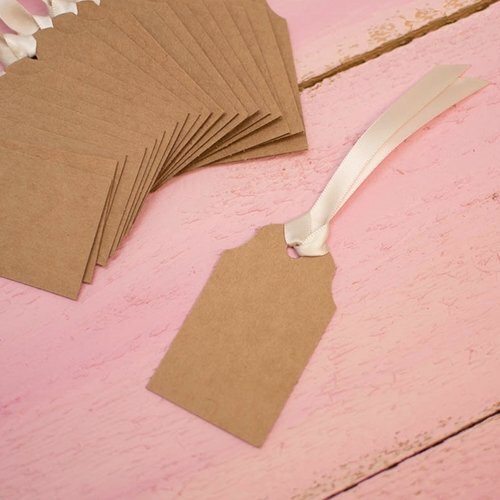 These Kraft paper tags are brown with cream ribbon and measure 3 x 1.75 inches each. 24 pieces per package. 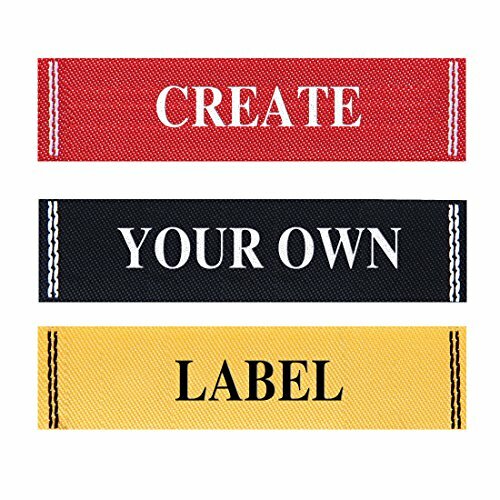 Customize your hand made items, gifts and clothing with Wunderlabel's Personalized Standard Woven Label Frame Tags. This can be custom made to your choice of color and text. Wunder label's tags are perfect for a range of clothing garments, whether to be used to sew on dresses, jumpsuits, shirts or blouses. These clothing tags are made from high quality 100% polyester and are not printed or embroidered on. They are designed to be sewn-in folded to prevent itchiness once the garment is worn. Available in different pack sizes from 50 labels, 75 labels up to 100 labels, Wunderlabel ensures excellent quality and durability using the finest materials. Our woven labels are made with professional weaving machines. Use this lovely woven tag on knitting projects, hand made items, sewing projects, craft gifts or clothing items. Add a personalized, DIY finishing touch to your garments with Wunderlabel's hand made woven label. Let us help you be the best you can be. Looking for more Sewing Ribbon Tags similar ideas? Try to explore these searches: Bottega Veneta Womens Handbags, Patent Mary Jane Shoes, and Luxury Vinyl Plank. Look at latest related video about Sewing Ribbon Tags. A video teaching how to print your own washable labels. Shopwizion.com is the smartest way for online shopping: compare prices of leading online shops for best deals around the web. 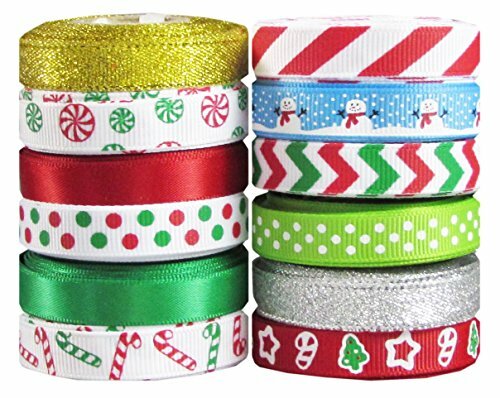 Don't miss TOP Sewing Ribbon Tags deals, updated daily.